“PFICs” – What is a PFIC – and their Complications for USCs and LPRs Living Outside the U.S. Passive Foreign Investment Companies (“PFICs”) have one of the most complex set of tax rules in the Internal Revenue Code. Many USCs and LPRs have no idea that they may have one – or several of them? Maybe they have owned hundreds of PFICs in their “plain vanilla” investment accounts? Maybe they have a private and closely held company with a few assets that cause it to be a PFIC? A PFIC can be as simple as an investment in a mutual fund that is formed outside the U.S.
Banks and financial institutions around the world promote investments in a range of mutual funds, such as Barclays in Spain, Barclays UK, Deutsche Bank, etc. Of course, if you live in your country of residence outside the U.S., you will most certainly be investing through the financial institutions that dominate that marketplace. PFICs can also arise from owning shares in a small private company that owns shares in another foreign corporation. The basic rule of when a foreign corporation is a PFIC, is if it meets either the (i) “income test” or (ii) “asset test”. There is no minimum ownership requirement. Owning 1 unit or share out of 200 million issued can still cause the investment to be a PFIC to the USC or LPR investor. 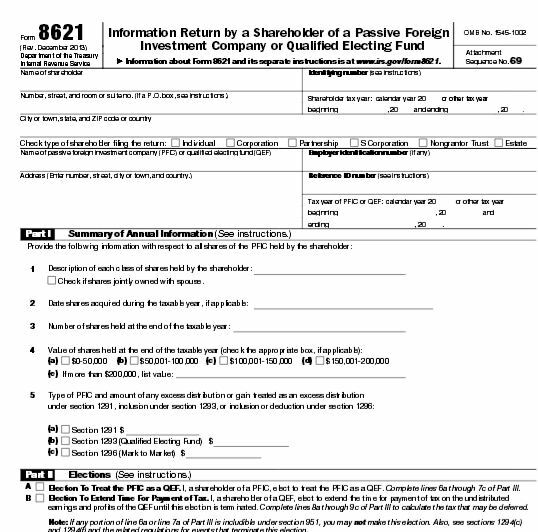 The USC or LPR residing outside the U.S. has to report the PFIC on IRS Form 8621, Information Return by a Shareholder of a Passive Foreign Investment Company or Qualified Electing Fund. As is almost always the case with the federal tax law, there are complex definitions and in this case complex regulations. New temporary (T.D. 9650) and proposed (REG-140974-11) regulations were recently issued by the Treasury Department for PFICs. The effects of a PFIC will be discussed in another post. They are not fun for the USC or LPR residing overseas – and can cause excess U.S. taxes depending upon (i) how long the the PFIC investment is held and (ii) whether any U.S. tax elections have been made by the United States Citizen or LPR. Unfortunately, the tax law does not provide any relief for USCs who, in good faith, failed to file or report their PFICs and the income and gains generated from such investments. More to come . 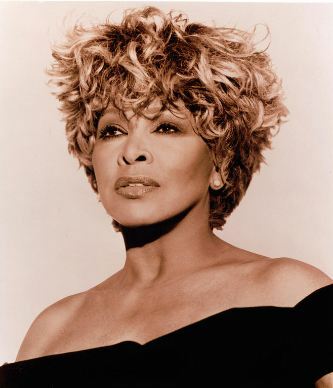 ..
Was Mother Teresa a “U.S. person” under the Internal Revenue Code subject to worldwide income taxation and FBAR reporting? Mother Teresa was named an honorary citizen by a proclamation of the U.S. President and an act of Congress. 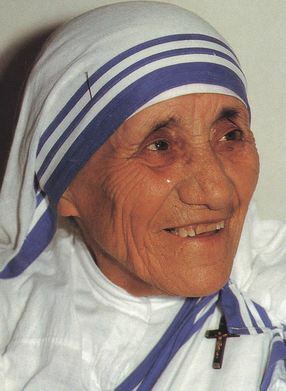 Mother Teresa received her honorary citizenship while she was still living in 1996 pursuant to Public Law 104-218. Did Mother Teresa need to file FBARS (foreign bank account reports) for the accounts in India and throughout the world where she oversaw non-profit organizations and had “signature authority over” such accounts? The FBAR filing requirement has been around since 1970, although only in the last few years have individuals and the U.S. federal government become aware and enforced it vigorously. Fortunately, for Mother Teresa and the executor of her estate, there was a 6 year statute of limitations against an assessment of FBAR penalties against her individually, over such non-U.S. accounts. When does the Statute of Limitations Run Against the U.S. Government Regarding FBAR Filings? Assume, however, that her Missionaries of Charity that operated in over 100 countries had some 50 accounts in countries outside the U.S. where Mother Teresa had signature authority over such accounts in 1996. In such a scenario, since Mother Teresa was an “honorary citizen” during that year, she presumably was a “U.S. person” under Section 7701 of the Internal Revenue Code. She would therefore also have been subject a host of other tax and filing requirements as a U.S. citizen. See USCs and LPRs Living Outside the U.S. – Key Tax and BSA Forms. Would she have had a legal defense (e.g., “reasonable cause”) for not being subject to the US$10,000 civil penalty per account for each failure to file the FBAR? In this example, 50 accounts multiplied by US$10,000 per account equals US$500,000 of civil penalties per year for failure to file. Sounds crazy – but it is the law and life in the U.S.
. . . La vida es misterio, devélalo. A lawful permanent resident (LPR) of the U.S. – or in other words, someone who has a “green card” – can lose permanent resident status through removal (“deportation”) or abandonment. First, an LPR may lose permanent resident status if he commits an act that makes him deportable, for example commission of a certain crime, and if the immigration court issues a final order of removal (“deportation”) after immigration court hearings. Second, an LPR may abandon his or her permanent resident status. An LPR abandons his or her LPR status automatically, by operation of law, when he or she engages in an abandoning act, such as submitting a Form I-407, Abandonment of Lawful Permanent Resident Status, or by simply departing the U.S. for more than a temporary visit abroad. Completing and submitting Form I-407 contemplates a conscious choice to abandon permanent resident status. On the other hand, departing the U.S. for more than a temporary visit abroad may lack the same formality but carries the same serious consequences. As a general matter, a permanent resident card is not a tourist vista. An LPR cannot live outside the U.S. and use a permanent resident card to visit the U.S. occasionally without maintaining signs of a residence in the U.S. The Department of Homeland Security (DHS) will make an abandonment finding after an LPR has taken a single trip outside the U.S. of more than one year, and the LPR can only challenge the finding in the context of removal proceedings. For a single trip outside the U.S. of six months up to one year, DHS will presume that the LPR intended to abandon his or her permanent resident status, but the LPR may rebut the presumption. Further, on a case-by-case basis, DHS may deem that an LPR has abandoned his or her residency even if he or she has not been outside the U.S. for more than six months on any single trip if he or she has spent a significant amount of time outside the U.S. on multiple trips abroad. The factors that DHS and the courts look at to determine if an LPR has abandoned his or her permanent resident status include the purpose and duration of the trip abroad; the event abroad, if any, after which the LPR planned to return; and the LPR’s family ties, employment, property holdings, and business affiliations in the U.S. and in the foreign country. Filing a U.S. income tax return as a tax nonresident alien raises a rebuttable presumption of abandonment. If an LPR is aware that he or she will need to spend significant time abroad, then he or she should apply for a reentry permit prior to departure. The reentry permit alone does not guarantee that the LPR will be allowed to reenter following a long absence, but the reentry permit increases the chance of admission and is evidence of the intent to return to the U.S. and maintain permanent resident status. The law that created the foreign bank account report (“FBAR”) filings is different from the federal tax law. The tax law is Title 26 and the Bank Secrecy Act, which creates FBAR requirements is Title 31. The laws are very different and have very different obligations and rights. One of the important differences, is the time frame in which the government can assess penalties. This law, according to its expansive terms (some would say extraterritorial application) applies to United States citizens residing outside the U.S. It also applies to most LPRs residing outside the U.S. See, FOREIGN BANK ACCOUNT REPORTS – 2011 REGULATIONS EXTEND RULES TO MANY UNAWARE PERSONS, published in the International Tax Journal. The statute of limitations is the time frame in which the government has to asses penalties for not complying with the law. These time periods are different under Title 31 versus Title 26. The failure to file an income tax return, means the time period against the IRS to make tax assessments against the USC or LPR residing overseas will never lapse. See, When the U.S. Tax Law has no Statute of Limitations against the IRS; i.e., for the U.S. citizen and LPR residing outside the U.S. In contrast, Title 31 the Bank Secrecy Act, does have a time period against the U.S. federal government, even if the FBAR was never filed. The time period for civil assessments of penalties is 6 years. 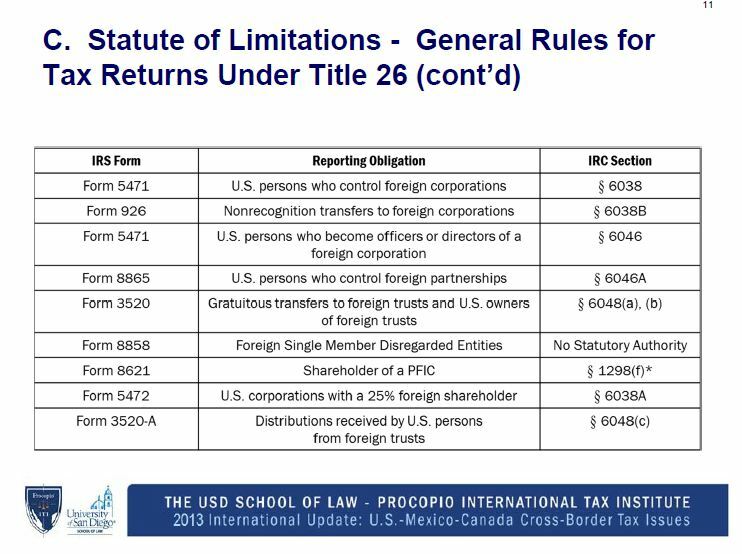 Importantly, a USC or LPR living overseas could become criminally liable for willfully not filing such FBAR form, which has different legal consequences. All FBARs must now be filed electronically. The filing of the FBAR form is not with the IRS, but rather with FinCEN. It must now be filed electronically on Form 114, Report of Foreign Bank and Financial Accounts through the BSA E-Filing System website. The electronic form supersedes TD F 90-22.1 (the FBAR form that was used in prior years). The laws of many countries outside the U.S. often conclude that the enforcement of these FBAR penalties in the home country of the USC violates the laws of that country (e.g., Canada). See the thoughtful article of Calgary based tax attorney Roy Berg – IRS says FBAR penalties not collectible under Canada-US Treaty? There are important legal differences between “renouncing” and “relinquishing” U.S. citizenship. Specifically, the federal tax consequences that follow from one versus the other can be quite important. The principle point is the “timing” of when USC status terminates. What could be the focal point of IRS Criminal Investigations of Former U.S. Citizens and Lawful Permanent Residents? More posts to following regarding “relinquishing” or “renouncing” U.S. citizenship. This entry was posted in Certification Requirement of Section 877(a)(2)(C), Famous People, Immigration Law Considerations, Tax Compliance. The foreign earned income exclusion is only available from income that is earned, such as income from salary and employment. It is not eligible for passive type investment income. The tax law in this area, like most areas of U.S. tax law is excessively complex in the restrictions and requirements that exist in the law. 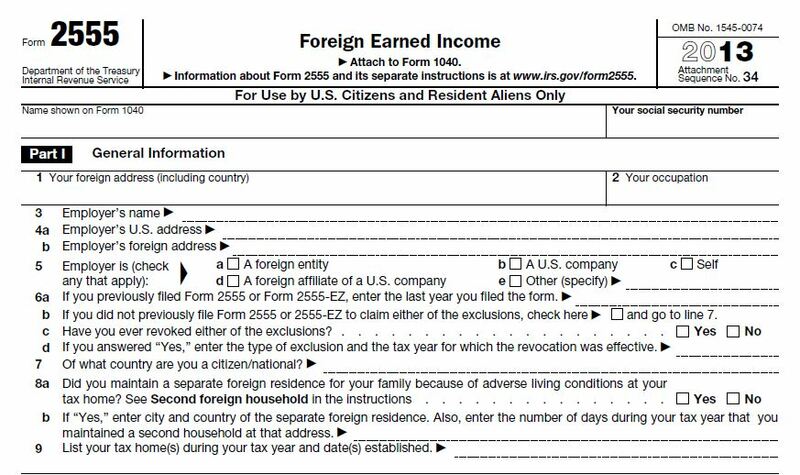 The foreign earned income exclusion (“FEIE”) is a completely different concept from the foreign tax credit (“FTC”). The foreign tax credit requires the USC or LPR to reflect the non-U.S. source income on their tax return along with the non-U.S. income tax paid. The FTC then allows a credit to be calculated to reduce the amount of U.S. tax, which may reduce it to zero. In addition, any excess FTC amounts (i.e., where greater taxes were paid outside the U.S. as compared to the U.S. tax) can be carried forward or carried back under a set of specified rules. 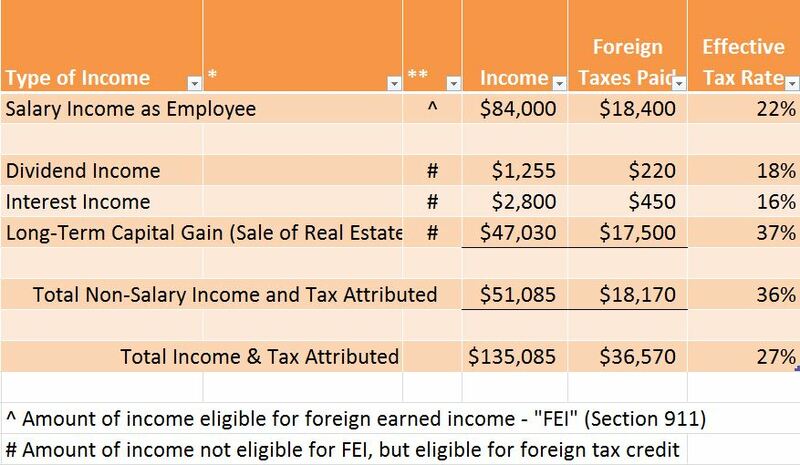 In contrast, the FEIE, simply excludes the entire amount of the “earned” income from taxation in the U.S.
One common misunderstanding, is that a FEIE is always better than a FTC. This is not always true. The following spreadsheet reflects “earned” income in the form of salary. The taxpayer also has three other different types of income; dividend income, interest income and long-term capital gain from the sale of real estate. As the example demonstrates, the USC or LPR living outside the U.S. has a higher tax burden in their country of residence on long-term capital gain, as compared to the tax on the earned income. Hence, in this particular case, the taxpayer will probably be better off by not electing to exclude the salary income from taxation under the FEIE. Instead taking a foreign tax credit for all income specifically including the salary income, i.e., “earned income” should produce a lower over-all U.S. income tax burden. I will demonstrate in a later post the actual difference between how the FEIE and FTC produces a different result in the above example. When do I meet the gross income thresholds that require me to file a U.S. income tax return? Unfortunately, the federal tax law does not work in such a common sense manner. Any USC individual (and any LPR who does not live in a country with a U.S. income tax treaty) is obligated under the U.S. federal tax law to file a federal income tax return IRS Form Form 1040 if they meet minimum thresholds of income. The thresholds are low, and are reached once the gross income is at least the sum of (i) the “exemption” amount (currently US$3,900 per exemption) and (ii) the “standard deduction” amount. Accordingly, even if a USC or LPR has even a modest sum of “gross income”, which equates to at least US$10,000 (in whatever currency earned), the USC or LPR will probably have a U.S. tax return filing requirement. To date, there have been numerous indictments of non-U.S. resident persons in the “offshore financial account world” which has been a great focus of the U.S. federal government starting in 2008. An updated list of indictments of these persons can be found at Jack Townsend’s federal tax crimes blog here where he keeps a spreadsheet of cases. To date, the author is not aware of any tax indictments (solely based upon a tax crime) of any United States Citizens or LPRs who have lived most all of their lives overseas. Is this an anomaly? Will the government be interested in bringing criminal charges against non-resident USCs or LPRs in the future? Those persons living outside the U.S. who have been indicted (typically for conspiracy/aiding and abetting charges) have been so-called enablers; non-U.S. bankers, lawyers and accountants. Some of these cases can also be reviewed at at the federal tax crimes blog of Jack Townsend, which is the most comprehensive source of this information. This entry was posted in Criminal Tax Considerations, Tax Compliance.